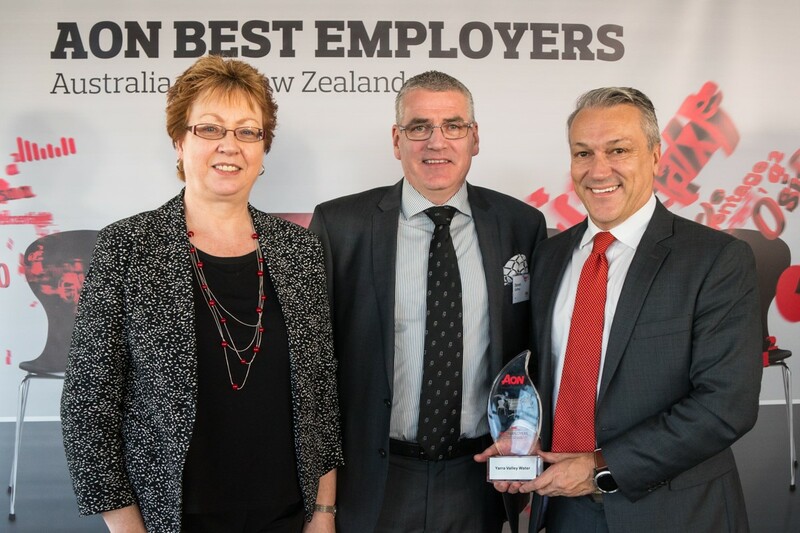 Yarra Valley Water has been recognised by AON as one of Australia’s best employers in AON’s recent announcement of the Best Employers for 2017. With employee engagement scores significantly above national averages, Yarra Valley Water is also the first Government enterprise to achieve this recognition. Managing Director Pat McCafferty and General Manager Anne Farquhar attended the announcement ceremony last week and were delighted to receive the award on behalf of the company. “This achievement has not happened overnight; our culture of transformation started many years ago,” says Mr McCafferty. With 87% of staff completing the survey in 2017 and an overall company engagement score of 83%, Yarra Valley Water is one of just 16 companies in Australia and New Zealand recognised for building a workplace that supports employees fulfilling their potential and achieving great results. “You can feel the pride our employees bring to work every day, but it is always very rewarding to have this externally benchmarked and validated,” says Mr McCafferty. This recognition is a significant milestone for Yarra Valley Water, featuring for the first time on the AON Hewitt Best Employer list. “Businesses are increasingly operating under changing and complex circumstances, including shifting economic and political climates. Organisations have to deal with increased volatility, complexity, uncertainty, and ambiguity,” said Stephen Hickey, Partner and Head of Employee Engagement, Asia Pacific & Middle East, AON. “We are so proud of this achievement however believe this is not the end of the journey for us,” says Mr McCafferty.